I wonder if the Bears would trade for Hilliard? Urlacher had knee surgery today btw. Same here. Willie Young, Lawrence Jackson, Cliff Avril, and KVB are enough DEs. This 'Grey' thing Gunther has been talking about may make trading Cliff much more possible since Suh and Fairley will occasionally play at the ends with Sammie Hill and Corey Williams as the DTs. If it would even be seriously considered, Willie Young and Brown would need to impress in every remaining preseason game. I think maybe KVB goes on the PUP list and they Keep Brown, or even possibly release KVB. As much as I like like him and the leadership he brings, Dude is just getting old. KVB had 8 sacks last season. You don't simply cut a guy the following season who got that many sacks. By all accounts he is healthy and just as energetic as ever. I think Everette Brown will become of victim of the numbers game in Detroit, but in all likelihood will be picked up by another team when the Lions release him. It wouldn't surprise me to see the Lions play Brown even more in the Ravens game, then have him be among the first camp cuts to allow him a good chance to be signed by another team with enough time left in pre-season that he can start to learn their system. They've done that for players in the past. Last year the Lions kept 4 DEs and 5 DTs to start the season. I think this year they will have to keep 5 DEs. Ronnell Lewis won't be here if they try to waive him so that they can put him on the PS. ALLEN PARK -- The Detroit Lions are in the final days of their 2012 training camp, practicing through morning showers at the team's practice facility on Tuesday. -- Offensive tackle Jeff Backus was given the day off on Tuesday with tightness in his back so Corey Hilliard and Jason Fox split the first-team snaps at left tackle. Simply put, Fox looked outstanding matching up head-to-head with Willie Young, Lawrence Jackson and Everette Brown. Fox is moving very well, and while he admitted to general camp soreness, he appears be as healthy as he's been since joining the Lions. -- Ndamukong Suh generally has a surly demeanor on the football field, but he seemed particularly on edge today. 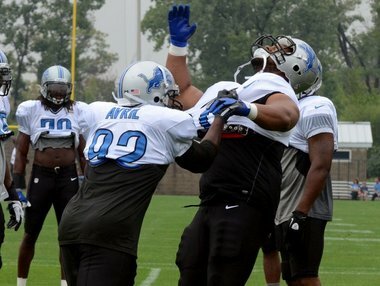 It didn't help that during defensive line drills, Cliff Avril hit Suh a little too hard with a two-handed shove, snapping the defensive tackle's head back (see the photo above). Avril was quick to apologize for his unintentional aggressiveness. -- Riley Reiff worked primarily at right tackle today, but also saw a handful of snaps at right guard. Dont' get too excited as the Lions have given all their backup tackles a few snaps inside during training camp in an effort to keep the group cross-trained for emergency situations. Offensive line coach George Yarno, who is one of the more vocal assistants on Jim Schwartz's staff, could be heard regularly praising Reiff today. Those kind of compliments aren't easy to come by for a rookie. -- While the wide receivers and cornerbacks work on a one-on-one drill, the Lions run a half-line drill with the running backs, offensive linemen, defensive line and linebackers on the other half of the field. One particularly funny moment happened when running back Stefan Logan turned the corner right into Nick Fairley, who picked up the diminutive Logan with one arm and spun him around like a rag doll. -- Also during the half-line drills, tight end Alex Gottlieb and defensive end Ronnell Lewis got into a shoving match. The pair were eventually separated and chastised by the assistants overseeing the drill. It was the first of several chippy incidents during practice as the players grow weary of hitting each other in the late stages of camp. -- For the second day in a row, Jacob Lacey worked the outside cornerback position opposite Chris Houston with rookie Bill Bentley moving to the nickel. Don't be surprised if Lacey gets the starting nod against the Ravens on Friday. -- With Stephen Tulloch sidelined today, rookie Travis Lewis got some work at the Mike with the first team today. Lewis looked like a five-year veteran, calling the plays and barking out adjustments to his more experienced teammates. He also flashed some quickness that he failed to display leading to the draft, getting out to the flat and making a stop in the backfield on a screen pass. -- Patrick Edwards was back after missing a pair of practices this week. He made a spectacular diving catch on an out route near the sideline. As he hit the ground his mouth guard flew out and rolled several feet into a group of media members gathered by the sideline. -- The punting competition has left something to be desired during training camp, but Ben Graham had a nice day, getting excellent distance (45-51 yards) on his directional kicks inside the 20-yard line. -- Nate Burleson and Bentley had a particularly physical exchange today as the veteran receiver tried to beat the rookie on a flag route from the slot. Even though Bentley didn't get his head around, he was able to read Burleson's eyes and knock the pass away. The pair came crashing to the ground hard, but Burleson smiled, picked the rookie up, and gave him a congratulatory slap on the helmet. Couple of quick updates, LeShoure (Hamstring) is back at practice this morning. Also back are Backus (back), C. Williams (calf), and Tullock (knee). Out are Broyles (knee), KVB (knee), and SLH (back). Detroit Lions GM Martin Mayhew's ability to retain all but one of Detroit's 2011 starters during the offseason allowed him to focus on adding depth during free agency and the draft. The result is the most talented team that the Lions have carried into training camp since before ill-fated former GM Matt Millen took control of the franchise in 2001. The roster isn't without its weaknesses -- secondary depth is an issue -- but solid competitions at several positions should make finalizing the roster a difficult task. Each week between now and roster deadline day, CBS RapidReports will try and solve the Lions' fluid roster puzzle. Here's our first attempt at projecting which players in camp will still be in Detroit's locker room come Week 1.
Notable numbers: When making these projections, we took some license when addressing some unique roster situations Detroit currently faces. RB Mikel Leshoure is suspended for the first two weeks of the season, so he'll be placed on a “suspended” list that by league rule doesn't count against the active roster. RB Jahvid Best and CB Chris Greenwood are also expected to begin the season on the PUP list, which means they won't count against the 53-man roster either. In an effort to be as realistic as possible, we will abide by these two scenarios when making projections. Stock rising: Seventh-round pick LB Travis Lewis, and undrafted free agent WR Patrick Edwards have distanced themselves from the other rookies on the Lions roster. Lewis' mastery of Detroit's system has seen him take some first team reps when Stephen Tulloch wasn't able to practice due to knee tendinitis, and Edwards' speed is impressive. Stock falling: WR Lance Long had a fast start to camp, but his play has dropped in recent workouts. The “Vanilla Gorilla” now appears to be on the outside of the roster picture looking in. Veteran safety Sean Jones struggled in coverage during the preseason opener. He's got a fight on his hands to make the team. QB -- In: (2) Matthew Stafford, Shaun Hill. Out: Kellen Moore, R. J. Archer. Analysis: Stafford and Hill are locked into the top two positions on the depth chart, and Archer hasn't seen enough reps to indicate that he's anything more than an extra arm during camp. That leaves Moore as the only question mark, and his performances in camp aren't impressive. Detroit didn't dress third QB Drew Stanton once last season, and the elimination of the emergency QB game-day roster designation devalues keeping a player on the roster destined to be a spectator. If Moore stays in Detroit, it'll likely be on the practice squad. RB -- In: (4) Kevin Smith, Keiland Williams, Stefan Logan, Joique Bell. Out: Stephfon Green, James Bryant (FB). PUP: Jahvid Best. Suspended: Mikel Leshoure. Analysis: Jim Schwartz appeared to seal Bryant's fate when he recently told reporters that Detroit didn't typically run a fullback-style offense. Green slid down the depth chart when Mikel Leshoure jumped ahead of him -- but behind Smith, Williams, Logan, and Bell -- when he returned to practice Monday. Bell looks to be a direct benificiary of Leshoure's suspension. 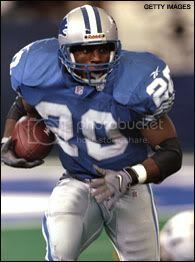 His 89 rushing yards in the Lions preseason opener went a long way toward convincing Lions coaches that he can handle reserve RB duties. WR -- In: (6) Ryan Broyles, Calvin Johnson, Nate Burleson, Maurice Stovall, Titus Young, Patrick Edwards. Out: Dominique Curry, Jarrett Dillard, Nate Hughes, Lance Long, Wallace Miles, Terrence Toliver. Analysis: Johnson, Young, Broyles, and Burleson are locks to make the team. Detroit usually keeps six WRs, and the competition for the final two spots looks to be between Stovall, Curry, and Edwards. Edwards' speed gives him an edge in the race, but he's battling ball-security issues. It's likely that special teams skill will help decide between Curry and Stovall. TE -- In (3): Brandon Pettigrew, Will Heller, Tony Scheffler. Out: Nathan Overbay, Austin Wells, Alex Gottlieb. Analysis: There's no competition here at all. Heller is an outstanding blocker, and the tandem of Scheffler and Pettigrew was one of the most potent TE attacks in the league last season. OL -- In: (9) Dominic Raiola, Stephen Peterman, Rob Sims, Jeff Backus, Gosder Cherilus, Riley Reiff, Dylan Gandy, Corey Hilliard, Jason Fox. Out: Dan Gerberry, Pat Boyle, Jacques McClendon, J. C. Oram, Jonathan Scott, Rodney Austin. Analysis: Detroit's 2011 starting O-line returns intact. First-round draft pick Reiff offers quality depth the tackle position, while Hilliard can fill multiple roles if needed. Fox gets the final roster spot in this projection over backup center Gerberry, and talented rookie Austin by virtue of his first-team work in camp. DL -- In: (9) Cliff Avril, Lawrence Jackson, Ronnell Lewis, Kyle Vanden Bosch, Willie Young, Nick Fairley, Sammie Hill, Ndamukong Suh, Corey Williams. Out: Everette Brown, Ugo Chinasa, Edmon McClam, Andre Fluellen, Tracy Robertson. Analysis: The top eight spots on the D-line are practically locked in, leaving the rookie Lewis and veterans Fluellen and Brown to battle for the final roster place. In the end, Lewis' youth, and versatility give him the edge. LB -- In: (7) Justin Durant, Stephen Tulloch, DeAndre Levy, Travis Lewis, Ashlee Palmer, Tahir Whitehead, Doug Hogue. Out: Carmen Messina, Slade Norris. Analysis: This unit is one of the deepest on Detroit's roster, and also one of the most stable. Five players return from a solid 2011 LB corps, and rookies Lewis and Whitehead are distancing themselves in camp. Messina is a candidate for the practice squad. DB -- In: (10) Bill Bentley, Jonte Green, Chris Houston, Jacob Lacey, Alphonso Smith, Erik Coleman, Louis Delmas, Ricardo Silva, Amari Spievey, John Wendling. Out: Drew Coleman, Justin Miller, Ross Weaver, Don Carey, Sean Jones, Reshard Langford. PUP: Chris Greenwood. Analysis: DB depth issues during the second half of the 2011 season cost Detroit dearly. Keeping two QBs and adding an extra DB -- Detroit carried nine for parts of the 2011 season -- creates a safety net against health concerns. The 10 players on the projected roster have taken most of the first and second team reps in camp. Silva's special teams skill and experience in Detroit's system gives him the edge over Jones for the final roster place. Special teams -- In: (3) Jason Hanson, Ben Graham, Don Muhlbach. Out: Derek Dimke, Ryan Donahue. Analysis: This is simply a case of experience beating youth. Dimke has kicked well in camp, but Hanson is an all-time great at the position who still has the ability to handle the job. Graham replaced an injured Donahue last season, and has outkicked the second-year player in drills so far this season. Follow Lions reporter John Kreger on Twitter at @CBSSportsNFLDET and @JohnKreger. Meanwhile, it was worth noting that rookie linebacker Tahir Whitehead kept his composure when veteran center Dominic Raiola whacked his helmet after getting tripped. Several defensive players surrounded Whitehead to prevent any escalation, but Schwartz was pleased with Whitehead's response and with how quickly order was restored. I have seen this reported twice now. Both times, Whitehead was praised for his composure. But, why on Earth was Raiola not called out for his lack of composure, either time? That was the big question on my mind as well. Raiola is a veteran, and a supposed leader. He should have been openly chastised for his actions. The first time I heard that story, I wondered the same, but the subsequent stories that said they were "working on" keeping their composure, makes me think it was intentional. It wasn't the vets that lost their cool in games last year, it was the younger players. Having the veterans randomly push buttons with the young guys makes sense. There's no fines in training camp and it helps the young players get used to what veterans on the other teams will try to use to draw a flag or just get you off your game. I bet that's not something they learn in the rookie symposium. I'm not saying for sure that is what they're doing, but if so, it's smart. this is bs, we all know raiola is a hothead. as m2k and billy said he should be openly chastised. you dont work on "composure" by having people hit each other late, etc - that is actually the opposite of what should be done. I agree. I've said for years that Raiola is a douche bag. Everyone jumped on his band wagon last year for being a "leader" but the guy is a P.O.S., flat out. I've seen the guy in public and he acts like an azzhat. I've seen all I need to know about that guy, and I think he should have been gone years ago. MAN I wish I was good at photoshop! ever since we started talking about Raiola I've had this mental picture of Cartman dressed as a policman with Raiolas face screamin "Respect my Authoritay!" I think that's a very remote possibility. Raiola has a reputation for losing his cool, and as such I don't think it was something intentionally set up by the veteran players and coaches. Besides which, if it was going to be done to someone, why pick a rookie and not one of the players who lost their cool last season, notably Suh or Pettigrew? No, I think it was yet another case of Raiola being an idiot, and he got some slack from the coaching staff....but really shouldn't have. as soon as nagy gets healthy dom,s days our numbered.nagy is a very talented olineman who played great until his ankle was broken last season. he is a massive upgrade over dom.